Now it is a well-known fact far and wide across the contiguous land and sea that your father is a Costco addict… I am letting you know this now because just as routine as milk is in the morning, every Sunday after church, like it or not, we must test our inner-peace by making a family outing to the nearest Costco, where your dad will be blessed with the joy of toting us through each and every aisle to make sure nothing has dropped in price since the last time we stepped across their sacred threshold. Now for a current household of only 2 and soon to be 3, it may seem that weekly visits to a large discount warehouse would be overkill. However the critical point of clarity here is that your dad is a willing victim and follower of Costco’s well-devised and diabolical coupon sales schedule. This means that even though we may be running on week 3 of no paper towels in the house, we may need to wait another 2 weeks before Costco will run their $2.00 off ad in the monthly mailer before we can purchase them again in good conscience. But rest assured, each excursion to Costco proves to be exciting and worthwhile none-the-less. For example, yesterday we got to buy another year’s worth of 9-volt batteries and also exchange all of last year’s light bulbs for the new more efficient ones that have just come into stock! Score! In addition to that, we have started your stockpile of diapers. 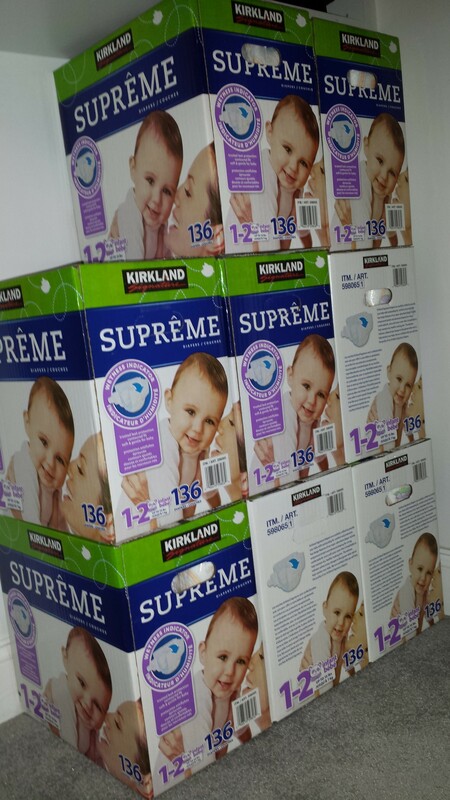 Your dad has been busy carefully scoping out all the competitive rates, sales and rewards plans, and he has determined that if we can catch all of Costco’s diaper sale waves over the next 28 – 34 months, at $5 off each box, times the 2 box limit, subtract manufacturer’s discount, multiplied by 2 separate member transactions, on 3-4 occasions bi-monthly, credit annual rewards points, divided by the circumference of the moon and rounded to the nearest half penny to account for cosmic tilt…. we will be able to diaper the WORLD for just under $364.92!